We often think of lesser-known works by celebrated authors as unloved manuscripts, collecting dust in archives—the province of specialists. All the more so if the work is scored for a now obsolete instrument or—worse—several of them. 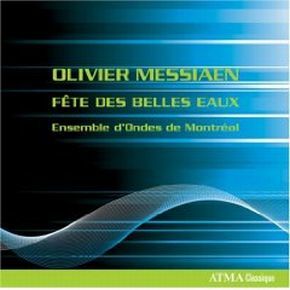 Messiaen’s haunting Fête des belles eaux, for example, has undoubtedly fallen by the wayside as a consequence of its scoring for six Ondes Martenot. Yet in the Paris of 1937 you could stroll out in the evening along the Seine and hear Messiaen's now long forgotten work resonating all along the riverbank. Commissioned by the Paris World Exhibition as an accompaniment to some light installations, fireworks and jeux d'eau, the music was tailored specifically to be in sync with the visual effects, and was projected over the water fountains and fireworks by means of loudspeakers. Messiaen's desire to inspire awe, and evoke space and water through music, are behind its peculiar instrumentation: the Ondes Martenot's phenomenal electronic resonance is combined with a timbral palette able to reproduce quite faithfully the sounds of certain acoustic instruments, yet its lack of attack creates the effect of a sound swallowed up by water—just like the bells of Debussy's famous Cathédrale engloutie. The outline of the music is very simple—long, meditative stretches entitled 'Eau' are interspersed with short, lively interludes entitled 'Fusées'. Even across these individual movements, the music is an ever-changing combination of a handful of inspired gestures: an arching arpeggiated figure, soaring from the bottom range; the giddy twittering of woodwind-like timbres; a meandering melody on a bed of modal chords (this a Messiaen speciality); a string of descending chords in a resolute 5/4. These combine to create effects of haunting beauty—from the chilling echo that shadows the sauntering tune of the third ‘Eau‘, to the recurring little dances of the 'Fusées', to the sinister whirlwind that opens the final 'Feux d’Artifice'. It is all phenomenal music, sensitively and elegantly played by the Ensemble d'Ondes de Montréal. Yet I often find that the Ondes is a much more awe-inspiring instrument live than in recorded performance: its resonance and power never seems to be able to pierce the sound surface on record; our loudspeakers at home can only convey a shadow of the grand, antiphonal musical design that Fêtes must have been originally. This is not a problem we encounter with the next work on the CD, Feulliets inédits. Following much more closely the traditional journey of the posthumously published gem, this unperformed manuscript—published for the first time in 2001— was indeed exhumed by the composer's widow Yvonne Loriod from a dusty pile after Messiaen's death. It is a small group of pieces for Ondes and Piano. The presence of the piano often limits the Ondes' palette to that of melody instrument—a kind of violin, or clarinet. Yet the sharpness of the piano attack is in some ways an ideal complement to the fuzzier timbres of the Ondes. Pianist Louise Bessette has a winning combination of rich warmth—the chordal piano entry of the third Feulliet, answering the Ondes' tentative call, is simply perfect—and sharpness of detail. The result is charming, and—as the 'Lent et Berceur' opening movement reveals— reminiscent of the chamber music of Ravel. Yet Messiaen's personality is still very much present: the third Feulliet has some birdsong in the piano, which is then picked up with an ominous timbre in the Ondes—something like a trumpet with a vibraphone's top-end resonance. And the use of the Ondes in the fourth and last Feuillet—as though the melody has lost itself in the halo of its own resonance—creates an irresistibly dreamy soundworld. The last track is devoted to a composer whose presence hovers over Feulliets inédits: it features an arrangement of the first movement of Ravel's String Quartet in F major. Ravel was himself a great fan of the Ondes, and although he died before being able to write for it, he reportedly confessed that the instrument reproduced the sound he often had in mind when composing. It is, though, difficult to imagine that anyone would prefer listening to this arrangement rather than the original version. The dreamy, out of focus timbre of the Ondes transforms the tender, quivering fabric of this quartet into something impalpable and slightly neutral. There are admittedly moments, such as the recurring pointillist halos in the two violins, that benefit from the immateriality of the Ondes' timbre. Yet the cello lines are completely lost in the instrument's colder lower register, as are the poised pizzicati that herald the end of the movement. What is more, the dynamic swells that accompany every sighing gesture in the quartet are sadly muffled in the transcription. This CD is a brave and imaginative venture from a set of excellent musicians; if you have been struck by the ethereal beauty of the Ondes in Messiaen's better known music, such as the Turangalîla Symphony, you will not be disappointed.